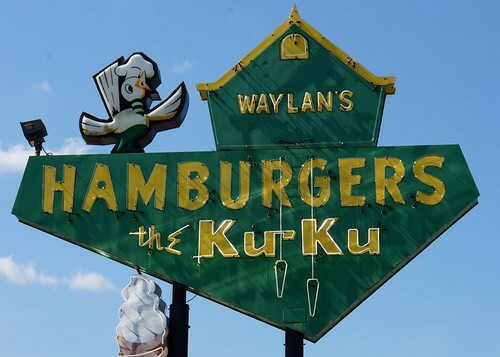 The first day of our trip was largely uneventful – we took the Interstate to St. Louis after work so we could make some progress on getting to the California border. 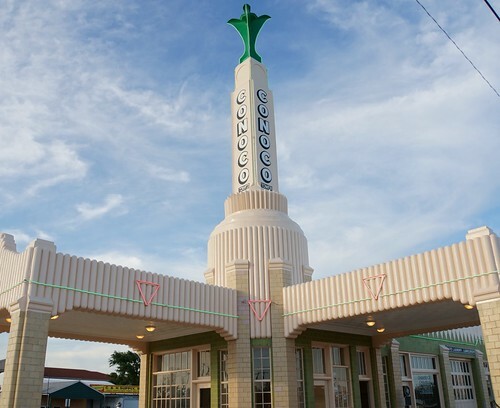 We stopped at Ted Drewes Frozen Custard and met with our camping friends Dane & Elaine, and then headed to our hotel, the Holiday Inn – Route 66….which was on Route 66! Day 2 was a partial day on the Interstate. Usually referred to as the Evil I, it did serve its purpose today – to quickly get us where we wanted to go. 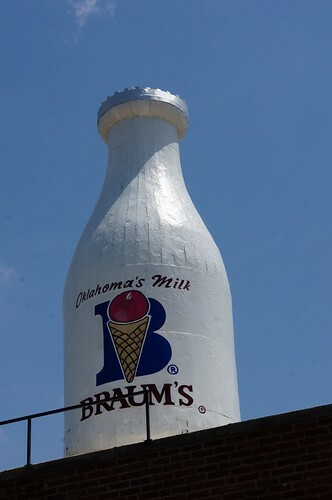 We love Missouri 66, but took the Route several times in recent years, so our goal was to get to western Missouri quickly, then slow down in Oklahoma. 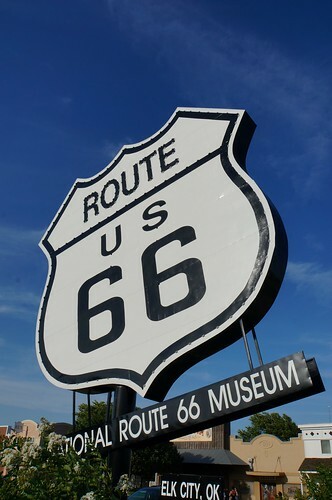 Plus, we’re strongly thinking about joining the 25th Missouri Route 66 Motor Tour this year! 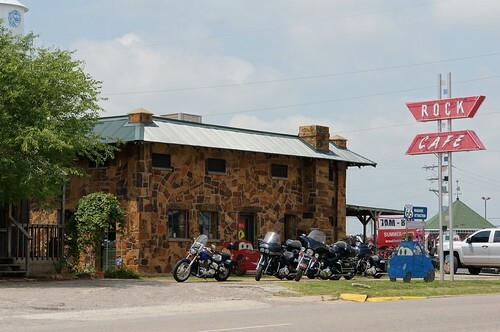 We did make a stop in Phillipsburg at Redmon’s Candy Factory – also a travel center/gas station, etc. By Joplin, we exited the Interstate for Route 66, but were bummed when we found the Candy House Gourmet Chocolates store was closed. 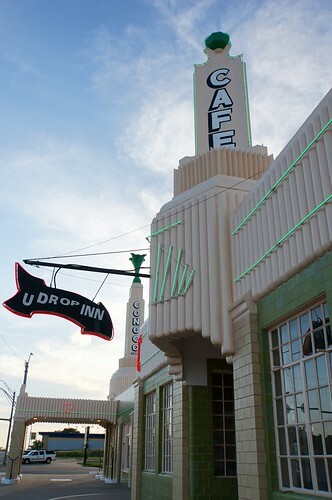 We’d been there last year during the Route 66 Festival and gone on a tour and were hoping for some chocolate! 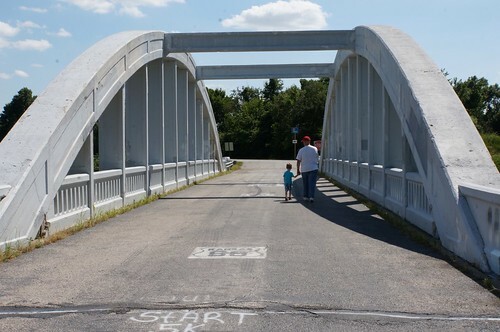 So we meandered on 66 and stopped at the Marsh Arch bridge. 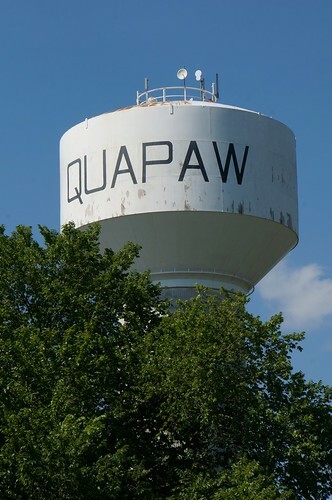 My grandson is fascinated with water towers, and this trip didn’t disappoint. 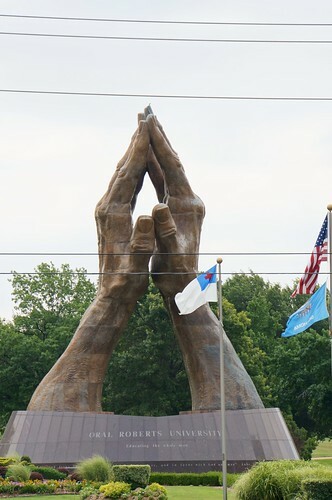 He saw plenty and really seemed to enjoy this one in Quapaw, Oklahoma. 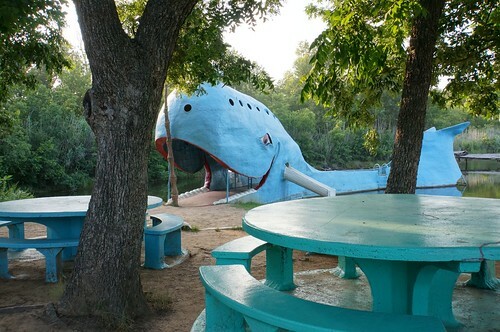 And of course, the big Blue Whale in Catoosa, Oklahoma! 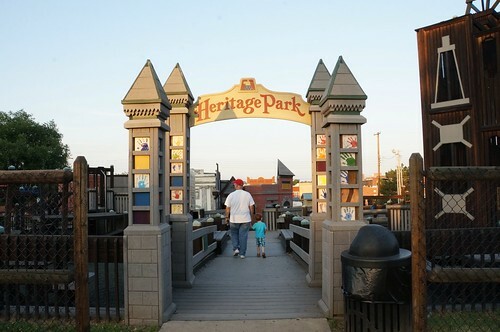 By this time, it was getting later in the day and we decided to stop at a really nice playground/park in Sapulpa, Oklahoma called Heritage Park (considering the missed chance to go on the amusement rides earlier). It’s a very nice park that was built by volunteer residents. It’s huge!! 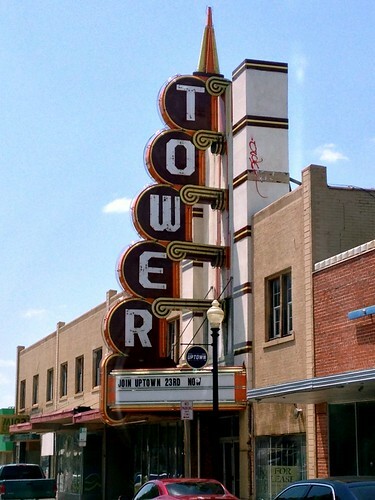 It was getting late and we didn’t want to miss anything driving in the dark, so we decided to go back to Tulsa to stay, as it wasn’t far. 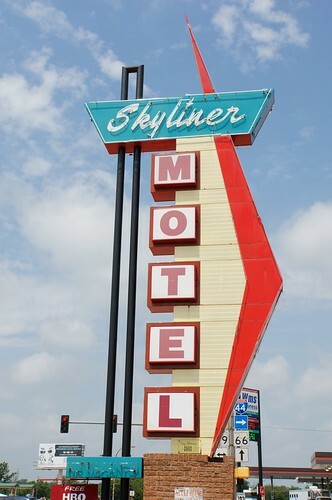 We did a Priceline and got the Crowne Plaza in southern Tulsa, but being the night of the 4th of July, several routes across the river were closed. We didn’t stop anywhere to watch fireworks, but we were treated to displays in all directions – that’s the good thing about the flat land. Ultimately, we made our way to the hotel after a number of detours, which you can see on the interactive map above…but finally we made it! Below is an interactive map of our trip, tracked using my Trimble Outdoors Navigator iPhone app. You can zoom in, or click the link below for a bigger, fullscreen map. Feel free to browse and refer to the map for details about where we traveled, the photos were taken, etc. 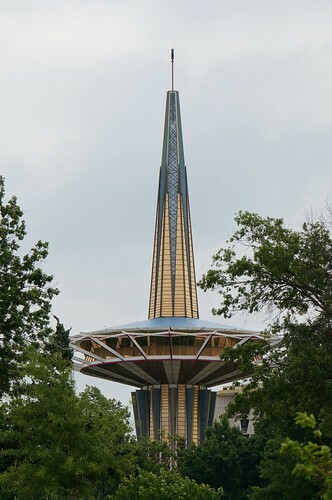 Coincidentally, our hotel was located across from Oral Roberts University, which was the site of a photo op from my Roadside America app, which helps me find neat roadside attractions and oddities from their site, in a pretty cool iOS or Android app. It’s also available as a Garmin GPS add-on too. 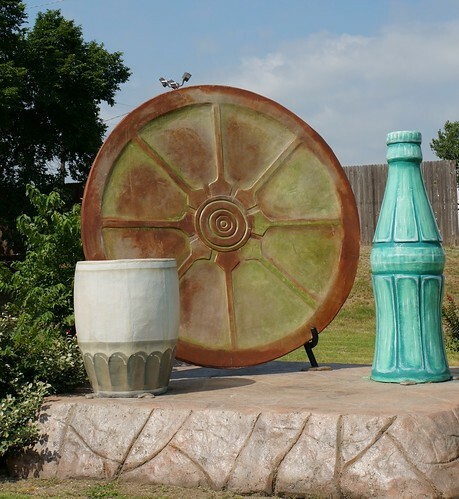 Heading back into Sapulpa, I spotted this art display which pays homage to the town’s manufacturing history, of glass and brick factories as well as Frankoma Pottery. 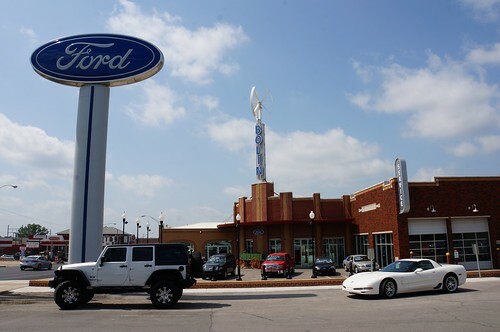 In Bristow, this Ford dealership’s new building was built in the style of the 1920’s architecture throughout town. 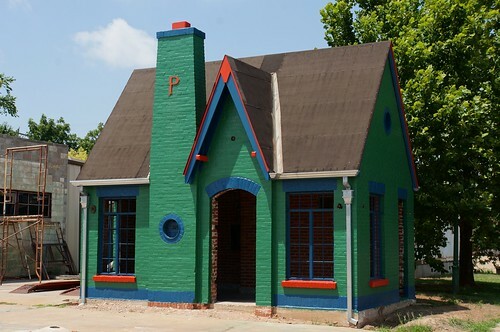 Their original building burned down, and they wanted to retain the original style when they rebuilt. 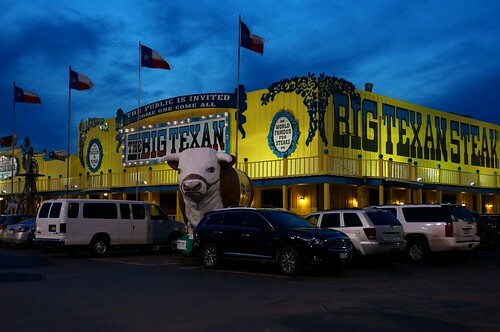 And the Big Texan, whose adjoining motel was booked up, unfortunately. We had an acceptable generic stay at a nearby Sleep Inn. Hope you enjoyed the ride! 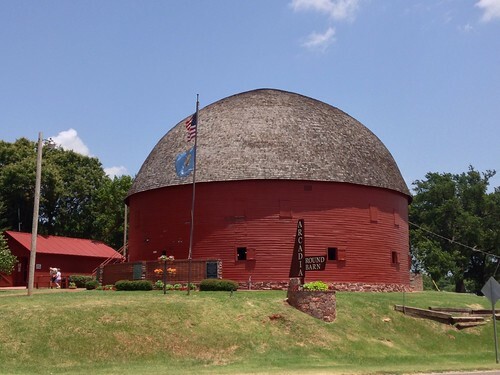 This entry was posted by Jennifer on July 17, 2014 at 9:00 pm, and is filed under Road Trips. Follow any responses to this post through RSS 2.0.You can leave a response or trackback from your own site.